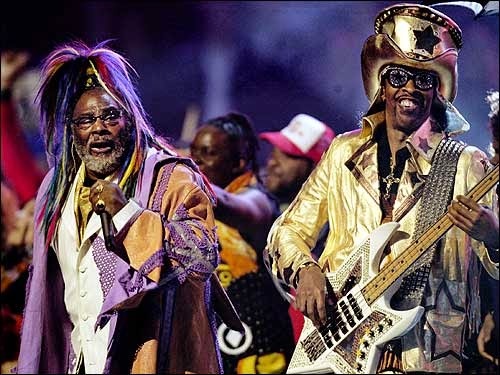 Rising to prominence with James Brown in the early 1970s, and later with Parliament-Funkadelic, Bootsy Collins's driving bass guitar and humorous vocals established him as one of the leading names in funk Collins is a member of the Rock and Roll Hall of Fame, inducted in 1997 with fifteen other members of Parliament-Funkadelic. Their debut LP, Stretchin' Out In Bootsy's Rubber Band, and their second release, Ahh the Name Is Bootsy Baby equalled anything issued during Clinton’s peak period for idiomatic diversity, clever, bizarre humor, and outrageous lyrics. Both Ahh… and the third LP, Player of the Year, earned gold records and made it into the Top 20 on the pop charts. The single “Bootzilla” was his lone R&B chart topper in 1978, although “The Pinocchio Theory” also made the Top Ten. Collins recorded as both a solo artist and with the Rubber Band in the ’80s. He also did some special projects, such as a 1984 collaboration with Jerry Harrison of Talking Heads — using the name Bonzo Goes to Washington — that produced “5 Minutes (C-C-C-Club Mix),” featuring Ronald Reagan declaring nuclear war on the Soviet Union over a skittering rhythm track. 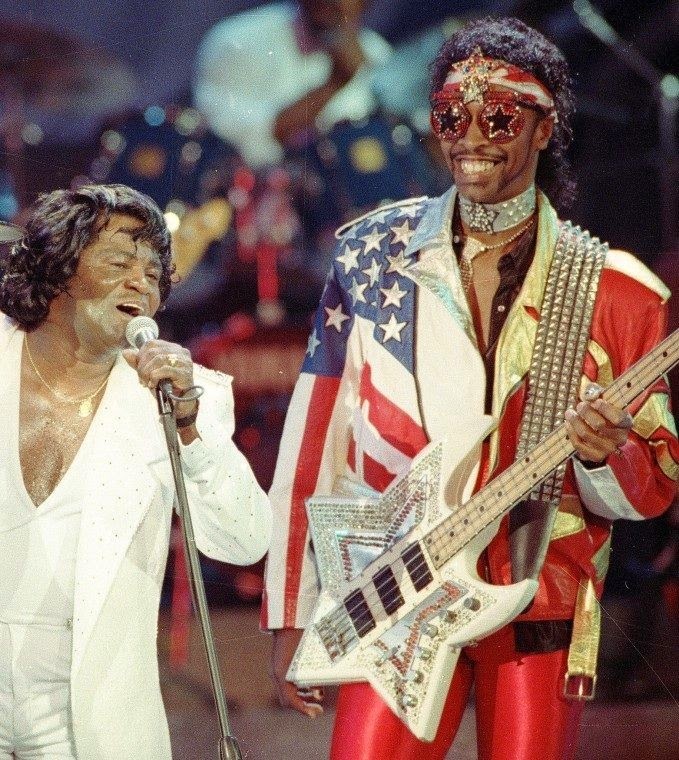 In 1988, he returned on Columbia with the appropriately named What's Bootsy Doin'? 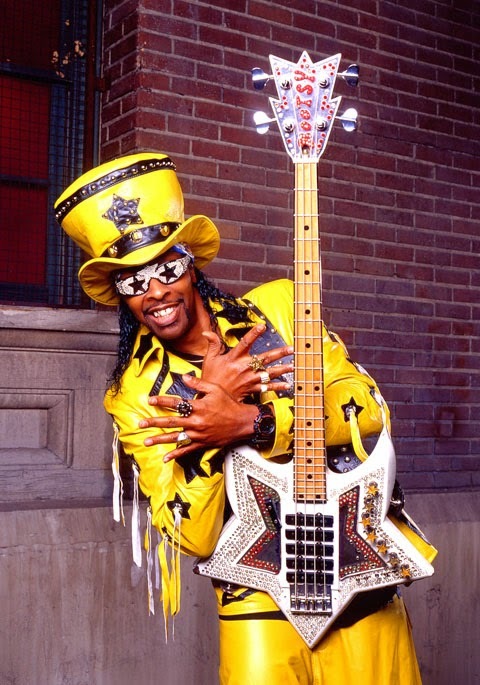 In 1989, Bootsy was a member of the Bootzilla Orchestra on Malcolm McLaren’s album Waltz Dancing. One year later, he became a featured guitarist and bassist with the dance music trio Deee-Lite, signed with 4th and Broadway, and also toured England with a group co-led by Parker and Wesley. Bootsy’s New Rubber Band released Blasters of the Universe in 1994, and Fresh Outta P University followed four years later. Numerous Collins live shows and reissues appeared as the 21st century opened, and in 2006, the bassist actually released a Christmas album, Christmas Is 4 Ever, on Shout Records. In 2011, a conceptual album, Tha Funk Capitol Of The World, landed, featuring everyone from Ice Cube to Samuel L. Jackson on the guest list.